Let’s face it. Summer starts on Friday, shorts weather is imminent, and most of us probably need to– ahem– “lighten up” a bit. I know I sure do… we’re headed to Miami soon, a hot and humid tropical playground, and jeans just won’t cut it. As part of my new “get healthy” regime, I’ve been replacing my afternoon snack with a green smoothie (aka The Greenie), and I’ve noticed a big difference in the way I look and feel. My skin is clearer, I have more energy and there’s a pep in my step. 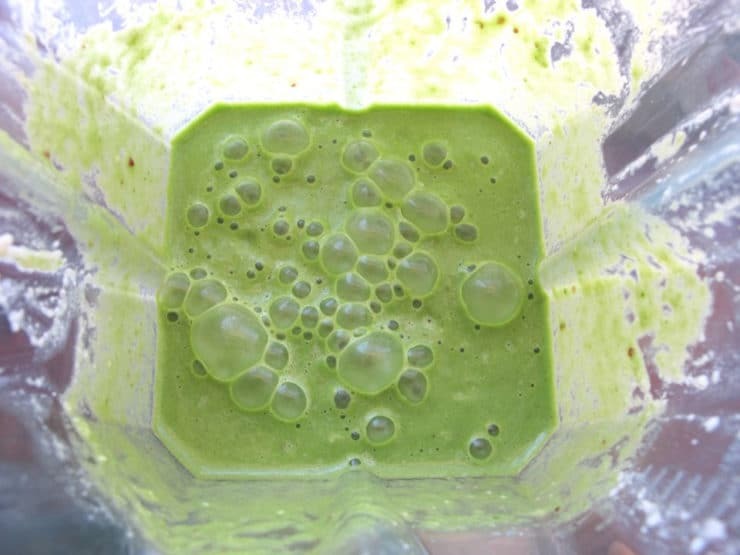 I’m loving green smoothies… but lately I’ve been finding that they don’t curb my appetite like they once did. It makes sense; the greenie I usually make doesn’t include protein, so it doesn’t satisfy my hunger in the same way a protein shake might. 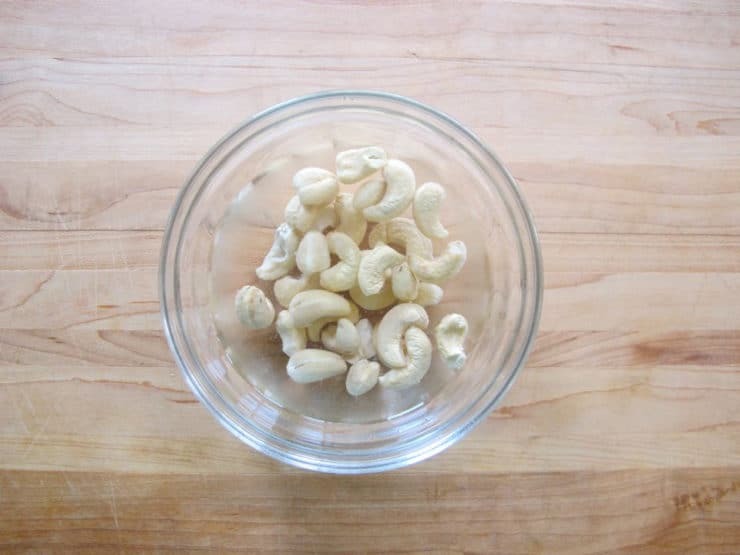 Enter cashews, the hunger-busting nut that never fails to eliminate my hunger pains. I used to rely on almonds for a quick protein snack, but a few months ago I learned (via my friend’s Korean doctor) that they were causing me to break out on my chin. I cut out almonds for a few weeks, and problem solved! Strange that something so healthy could have been the source of my skin trouble. At any rate, I replaced my daily almonds with raw cashews, and now I’m finding all kinds of ways to use them in my cooking. They blend up rich and creamy (see my cashew milk post if you want to make your own homemade dairy-free milk at home). 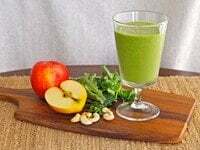 It wasn’t long before I made a new green smoothie with them– organic baby spinach or baby kale, apples, cashews, a little banana and spices. The results were spectacular. The drink turned out smooth, creamy and mellow. It was almost like a green milkshake. I know, that sounds so gross. Trust me, it’s yummy. It’s also incredibly healthy. 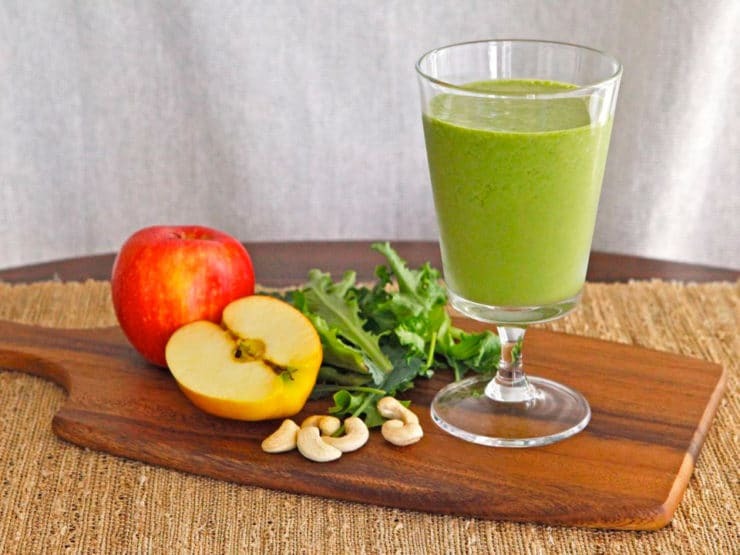 This Cashew Apple Green Smoothie takes a bite out of the hunger monster, so I can make it to dinnertime without feeling ravenous. Green smoothies for the win! Have you tried a green smoothie yet? How do you get your daily greens? Do you prefer smoothies, juicing or a good old fashioned salad? 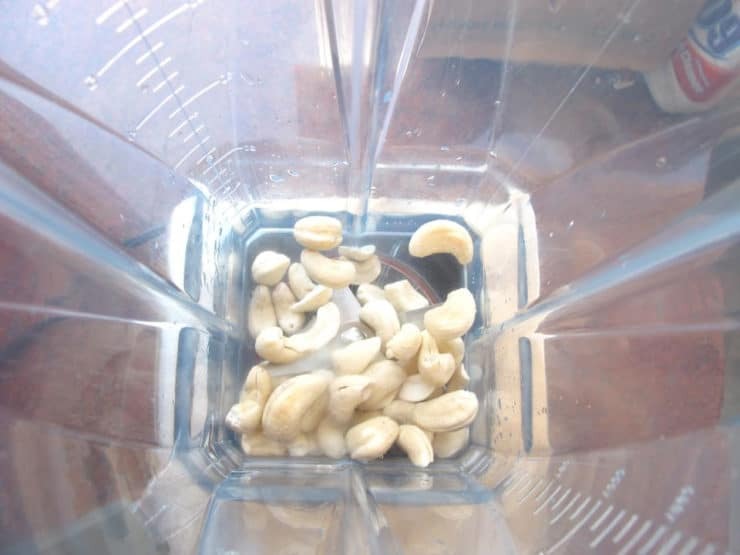 Blend till the cashews and water look like milk. Add one handful of the apple chunks. Blend till the mixture is liquid. Continue adding the apple and banana in small handfuls, blending each handful one at a time, till all of the fruit chunks are blended in. Add the ice cubes, cinnamon, nutmeg and sweetener. Blend till the ice cubes are thoroughly crushed and the mixture is smooth. I blend it for at least 1 minute to make sure all of the greens are totally pulverized. You may need more or less ice cubes depending on the size of your cubes-- just add them till the mixture is thick and milkshake-like in texture. Divide the smoothie between two large glasses and serve. There may be a little left over, which you can use to top off the glasses after sipping them down a bit. Enjoy! 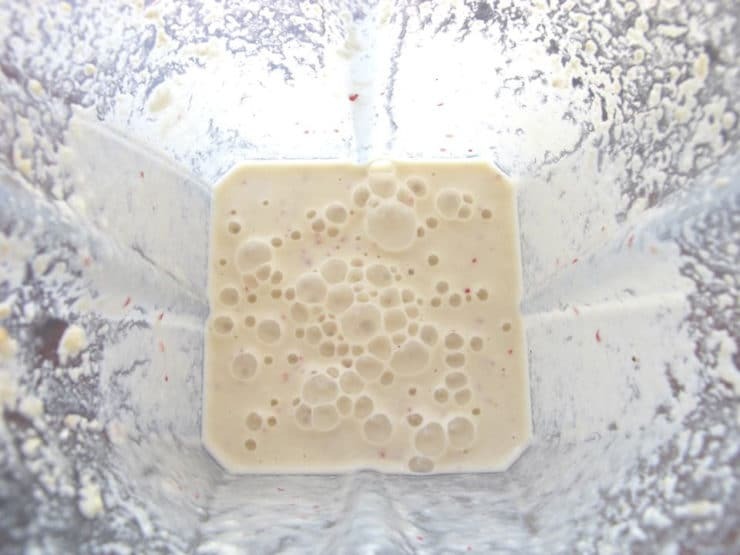 Thank you for this wonderful smoothie recipe! The only thing I would change is the choice of sweetener: organic maple syrup. One only needs a touch of it. Truvia is owned by coca-cola (Cargill) and is not stevia, but a stevia product. Agave is also a huge unhealthy farce. May as well be corn syrup. Other than substituting maple syrup, your recipe is perfection. Excellent. Just halved the recipe and made it in my Vitamix smooth maker and it was great. I did however reduce the cinnamon to 1/8 of a teaspoon. Just made this- Loved it! My kids loved it too. Thanks for the recipe. I’ll definitely be making this again. I would drink this as a dessert! Tori I am enjoying your site so! I love the pictures and your stories. Great readings. Thank you. Oh does that sound good. I am a diabetic and I’m wondering if you have any idea of how many carbs one smoothie has? Wow, looks awesome! I make a green smoothie every morning with kale and protein powder, but am intrigued by the cashews. Do they alter the taste at all? Carlyn the cashews add creaminess, but the cashew flavor is not overpowering. Daily? Lol! We like all of the above, we love green stuff! This shake looks like the shiksa! I have a protin powder i add to most smoothies and sometimes even popsicles shhhh dont tell hide stuff in all the foods here! But the girls have developed quite the pallet guessing my secret ingredients! Thanks for this yummy smoothie but I will add in honey or go to buy a bottle of stevia as it is made from a type of leaf !! We can find these leaves in the Chinese medicated shop too. Wash it and boil with some water and a syrup is formed. Never tried as I eat less sugar — I don’t have a sweet tooth ! Does it mix with Vodka? Easy peasy! 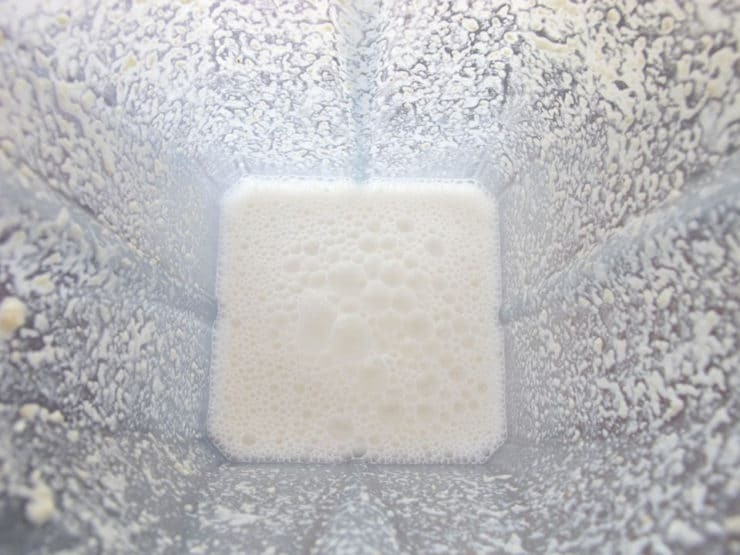 Pour out smoothie, rinse blender with water, add a couple of drops of dish soap, fill blender 1/2 full with hot water, blend starting low then on high for 30 seconds or so, rinse with water and invert to drain dry. Takes me 1 minute. I learned this from my VitaMix demo when I got machine. Combo of juicing and salads. Greens. From the garden. Fresh ! Salads and wine. Beer, ale, and granola for my grains.